The P.O.P. 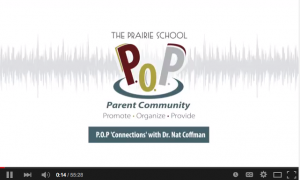 Parent Community ‘Connections’ meeting on February 17 featured a conversation with Head of School, Dr. Nat Coffman. With a career in independent schools that spans over 20 years, Dr. Coffman offered his thoughts on why students who attend schools like Prairie are successful, what authentic success means for our students, and how parents can provide the tools necessary to help their child achieve academic success and become leaders of their lives. Dr. Coffman also shared what he has learned about Prairie since joining the school in the fall, and how the families at Prairie can help support the vision for our community. His conversation was followed by a time for questions from the parent group. All parents are encouraged to submit topics to discuss at the next meeting to Callie Atanasoff ([email protected]).